Pumpkin pie has always been my all-time favorite dessert (and breakfast, for that matter). And I have to admit that I am a bit of a pumpkin pie snob. In my pre-Paleo days, I was well-known among my friends and family for making The Best pumpkin pie. It was a pie that converted many non-pumpkin pie lovers. Many people would say that the only pumpkin pie they liked was mine. My recipe was a secret, but it was based on my mother’s, which was a family recipe modified to accommodate my brother’s extensive food allergies. I can give you the secrets to my old pumpkin pie recipe now, since I won’t be making it that way ever again. Because my brother was allergic to cinnamon, the spices were modified to replace it. As chance would have it, leaving the cinnamon out actually enhances the flavor of the pumpkin rather than hide it (you could of course, substitute my spices in this recipe with your favorite combination for pumpkin pie). Because my brother was allergic to dairy, the standard evaporated milk was replaced with soy-based baby formula, which added a wonderful richness and slight nuttiness to the pie. These modifications made the tastiest, creamiest, most awesome pie ever. And it was always our tradition to have pumpkin pie for breakfast the morning after Thanksgiving. Yum! So, when I embarked on my adventure to Paleofy pumpkin pie, I didn’t want to create just another pumpkin pie recipe. 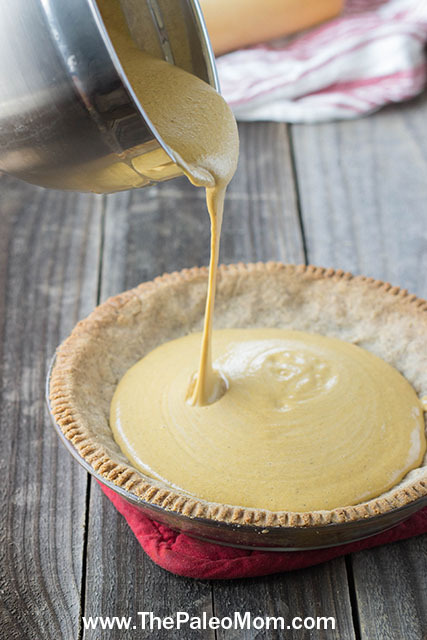 Plenty of people have paloefied pumpkin pie simply by replacing the evaporated milk with full fat coconut milk and throwing it into an almond flour crust. No, I wanted to recreate MY pumpkin pie. The Best Pumpkin Pie. I wanted to make a pie that you can serve your non-Paleo friends and family and they would never know! A pie that can convert non-pumpkin pie lovers! This pie is a very creamy-style custard pumpkin pie, which has always been my preference (think thick mousse). 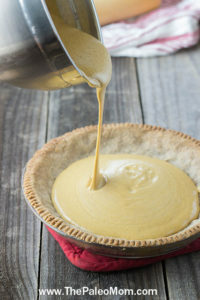 If you prefer a more solid pumpkin pie, simply reduce the water (you can add more pumpkin to replace the volume if you wish, but it is not necessary). Because the goal was a pie so good that you can serve it to non-Paleo company, this is a bit sweeter than I would normally make for a Paleo dessert (not that it’s super sweet, it’s actually the same amount of sweeteners as other Paleo pumpkin pie recipes out there– but you will definitely feel like you’re having a treat). You could cut the honey and maple syrup down to 1/3 cup total if you wanted and just add a couple extra tablespoons of water. I actually got the custard the way I wanted it on the third try with this pie. The biggest trick was the crust. I tried a few different Paleo pie crust recipes (anyone who follows me on Pinterest knows I was collecting different versions of Paleo pie crusts to use as a foundation to build from). I also tried several tweaks of a shortening-based version, which tasted great but remained too soft and crumbly. In the end, I came up with a crust that tasted great (especially in combination with the pumpkin custard), had the right texture, and held together beautifully. I hope you enjoy my version of pumpkin pie as much as my family and I do! Note: If you want to just make the pumpkin custard, you don’t need the extra yolk leftover from making the crust. It will work just fine with 3 whole eggs. Previous Post: « TPV Episode 11 Show Notes: What’s Up With Dairy? I need to test myself with eggs again and I was waiting for a recipe to try that was really “worth it” – I think this is the one! I’ll definitely be making this sometime very soon. Yay! It’s coconut free… my older son is very sensitive to coconut and dairy. This looks like the pie to try for him! You do not know how happy this makes me. I developed an intolerance to cinnamon in my 20’s and love pumpkin pie so much I would just eat it anyway (once a year) and then suffer with sores in my mouth for a week or two. I’ve googled for YEARS trying to find a replacement for cinnamon and never could find an acceptable flavor combination. I’m buying the stuff to make this TODAY. My father was allergic to soooo many things, including cinnamon and honey. We used dark brown sugar and vanilla to flavor the pumpkin pie for him…it was actually quite tasty! It looks delicious. I can’t wait to try this! Looks amazing and I can’t wait to try it! Should the walnuts and cashews be soaked first? Oh, nuts! This looks amazing, but my son is allergic to nuts. I was really looking forward to this recipe, too. •	YUM!!! Do you think this will freeze and transport well? 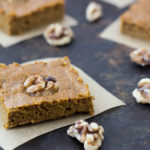 Since there is no dairy I may have to ask my mom to make this and send it to me here in Afghanistan so I can have some pumpkin pie for Thanksgiving that’s not only delicious but Paleo as well! Thank you Sarah! It’s a pretty soft custard. I’m think it joule probably freeze well and ship okay as long as it stayed frozen, but if it thawed in transport, bad things would probably happen. This looks great. It will be my birthday ‘cake’ this year! LOL! Yeah, my family was totally on board with my “just one more small change” iterations on this one! This pie looks drool-worthy! I can’t wait to try it out on my family in November. Sarah, I just also want to let you know that the PrintFriendly widget didn’t work well for me. It did not print the ingredients for the pie crust and pie filling. Also happened with the Paleo mayo and ranch dressing recipes. I just printed them the old fashioned way, but I thought you would want to know about the PrintFriendly issue. Thanks for the recipes!! I think I need to try a new widget. I’ll see if I can get that done today or tomorrow. I have come across lots of recipes in the Paleo world that require raw nuts. Can non raw nuts be used also so long as they are not roasted? I live in rural southwest Virginia and cannot find these at a grocery store and the expense is also a deterrent for my grocery budget. You can use roasted and unsalted nuts in this recipe. Raw nuts puree better, which is why I suggest them. I find the cheapest raw nuts at Costco and at Trader Joes. 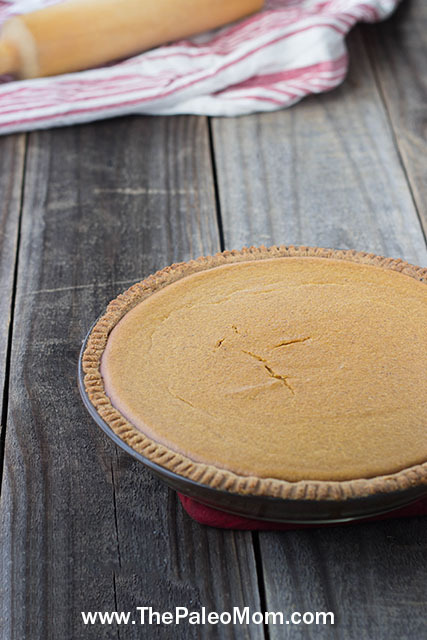 So… inquiring minds want to know- what is your former non-Paleo best pumpkin pie ever recipe? Thanks. Is there a substitute for the almond flour? I unfortunately am allergic to almonds, pecans, hazelnuts, and macadamia nuts, but can eat cashews and walnuts. I usually look for coconut flour desserts, but love my pumpkin pie! I think it would work with any lower fat nut or seed. Maybe ground pumpkin seeds? or you could grind shredded coconut? Thank you for these ideas. I seem to have problems with almonds now too. And thank you sooooooo much for your hard work. This is one dessert that I love and miss so much. You are awesome!!! Such a blessing to us! I ended up with a very liquid custard mixture (about the consistency of cream). At 40 minutes a knife inserted halfway between the edge and the center came out coated with runny custard. So I kept baking and testing until I got to 1 hour 10 minutes, at which time there was merely custardy custard on the knife. The cooled custard has a great texture and flavor, but sadly the crust got very overlooked in the process. I’m wondering if the bake time would be shortened if I leave out the water from the filling-but will the custard still cook up properly? I’m wondering if your pumpkin puree was very watery (I definitely get very random thickness with homemade pumpkin puree)? If it is, you could increase the pumpkin puree to 2 1/2 cups and leave out the water completely. Then, the cooking times in the recipe should work. I hope this helps! I had the same problem! I think I need to remake mine without the water. Ugh!! So wish I’d read these comments before pouring the water in!! I thought surely it wasn’t needed… but added it. Now I have lots of runny custard left over and I’m afraid of what the pie my oven is going to end up like. Bummer!! The recipe needs to be changed to reflect this, for the future searchers! I used the Farmers Market canned pumpkin. It seemed very firm (almost crumbly) to me. I’ll try it without water and see what happens. Thanks for such a prompt reply! 1 whole tsp of nutmeg, allspice and ginger? that’s really a LOT. Is that right? ^^hahaha^^ Well, I have it cooling on the stove right now! Looking very much forward to tasting it for breakfast!! Made this today and it is delicious. I’m just wondering why you chose to use water instead of full fat coconut cream/milk. For allergy reasons? It seemed like the coconut milk would’ve offset the spices a bit since there are alot. The consistency did work out well. I have also tried hazelnut crust which I think I preferred but overall, thank you! The idea was that water plus nuts equals pulpy nut milk. I don’t like the flavor that coconut milk contributes, but there’s no reason why that wouldn’t work in this recipe if that’s what you prefer. Also, love the Paleo pancake idea…. and that it’s NOT like all the other recipes that promised to be “just like real pancakes”!!! NOT!!! Man, do they lie!! Makes me wonder if we’re all living on the same planet. 😉 Look fwd to trying yours!! Thanks for all your hard work & determination & persistance PaleoMom! I made this pie crust and tweaked the custard to my own liking. The crust is absolutely excellent, but my roommate is allergic to honey. As an alternate sweetener I took twelve large medjool dates and boiled them in hot water for five minutes. Then I de-pitted the dates, and processed them into a sweet mush. Then I mixed them into the custard. The dates were a fantastic alternate to honey and maple syrup. Also, since I am too poor to buy a million different spices I used plain old pumpkin pie spice instead. I used a lot, and when I originally tasted the custard I thought it would be too much, but when it was baked the flavors balanced out perfectly. In addition to the roomie who is allergic to honey, I have a roomie with lupus, a gluten free rooomie, and one who doesn’t like dates. I told the one who didn’t like dates that she could skip if she wanted. Once she tried it and realized that you couldn’t even taste the dates, she loved the pie…. Overall everyone here was thoroughly satisfied with the pie. Thank you for this amazing idea PaleoMom! I will be making a second pie soon. How much pumpkin pie spice did you use? Drat. How about pecans and macadamias? Oohhh if I bake/toast the pecans first, I can have them, and macadamias are fine. Thanks! I made this tonight without the crust. I used walnuts and almonds. No maple syrup so I just omitted it and added a little extra water like you said. It turned out so yummy! Thanks for a great recipe that allows me to stick to the Paleo diet. we don’t use maple syrup and I was curious how much water you added in place of the maple syrup? Could you double the honey and omit the maple syrup? I would add 1:1 water for maple syrup. You could absolutely sub with honey. Just made it last night without the “crust” – was delicious and filling. I cut back a bit on the honey and syrup and increased the spices a notch. This sounds great! I can’t do eggs or almonds, so I am going to try coconut flour and coconut milk for the custard. I’ll let you know how it works. Made this pie for the second time hubby loved the first one but wanted to know is I could make it denser like a “real” pie. So I gave it a go and I accomplished it! Thanks for giving me the courage to “play” around with recipes. Modifications I made: replaced the ground nuts and water with I cup of puréed green plantains, used only 3 eggs. I also used a standard almond flour pie crust because I didn’t want to go to the store again! Do you happen to know the carbs? What do you suggest for a substitute for Almond Flour? My daughter is allergic. Thanks. What could I use instead of cashews in the filling? Just more walnuts? Can’t wait to try this! I’m curious, do you have any idea if the pie crust would hold up well if I made it in advance and froze it? I’d thaw it out 4 or 5 days later to fill with the custard. I think it probably would, but I haven’t tried it. Any substitutions for the cashews. My boyfriend is allergic and he misses my baking. This sounds like a Paleo alt he’d love. I think macadamias would work very well. Both my parents are diabetic and my dad goes a little crazy eating at Thanksgiving. I’d like to make this with the fewest carbs possible. How far do you think I could cut the honey and maple syrup and it still taste good? My dad has always liked his pumpkin pie heavier on the spice side and less on the sweet side, if that helps at all. I was thinking cutting both the honey and maple syrup in half, replacing with water and adding a bit more of each spice. Wish I had the time to do a test run of the pie. I made a version with half the honey and maple sugar and we all liked it, but we are used to baking that isn’t very sweet. If that already sounds like it fits with your Father’s taste buds, then I say go for it! I already have a bag of unblanched almond flour. Will that work? Just made a different recipes from a much-touted Paleo-recipe-developer that was a big disappointment 🙁 I think I’ll have to give yours a try too. Nothing wrong with a little extra pumpkin pie, right? I can’t find any almond flour locally. What could I use instead? You could grind almonds or some other nut or seed in a food processor. Hello, this looks simply delicious! This year is my first gluten free Thanksgiving. Pumpkin pie is my favorite dish of the holiday and this will be my first try at gf PP. I have looked at A LOT of recipes and this one looks the most appealing…I was wondering why you don´t use coconut milk? I ask because in almost every other recipe I have seen they add the coco milk…do you think the flavor would change with the use of coco milk, I am looking for the most authentic tasting pie and I loved your story! thank you so much! I avoided coconut milk because I don’t like the flavor in pumpkin pie. I just made the crust using ground up raw pecans and 1 C coconut flour along with the salt and the egg white. The crust is very very dry and crumbly. I nevertheless pressed it into a pie pan, but its dry. What can I add to make it more moist? Suggestions? Thanks! Next time use finely shredded coconut instead of coconut flour (if yours isn’t that fine, you can pulse in in the food processor). If you haven’t baked it yet you could try adding an extra egg white. i am going to make this pie tonight – I can’t wait! I’d like it to be dense like a traditional pumpkin pie. Could a little arrowroot make this pie slightly denser? It’s creamy like my mom made. If you want it denser, just reduce the water. This pie was a huge hit even with the non-Paleo crowd at our dinner. Next year I will make more than one! Great recipe! I just made this, but I couldn’t use cashews (food allergy) and I was out of maple syrup, so I used a bit less than 1/2 cup honey, plus 1 tablespoon molasses. For the cashews I subbed 1.3 ounces (by weight) of almond meal. I also had the too-liquid problem (homemade puree), so I baked it my mom’s way of 425 degrees for 15 minutes, then 350 for 30 minutes (40 in my case) and it came out perfectly. Thank you SO much! I also buy my spices whole and ground them when I use them, so I want to share a note for anyone else who does that: the cardamom in here is approximately 2 medium BLACK pods, or 1 pretty large one. Excellent! This is a spicy pie, and I adore the addition of cardamom. I had a bit of extra filling, so I used 2 ramekins for the extra and had some crustless, which was great! I used almond milk instead of water, no reason, just thought it might be nice. It did make it sweeter, which it didn’t need. This is a treat, which I’ll need to share or I’ll end up eating the entire thing! This was really good. I used macadamia instead of cashews and regular brown sugar because one of my family members has a fructose sensitivity and can’t eat honey and maple syrup. This was my first time eating cardamom, I think. I really liked the spices in this pie. I think better than the traditional spice mixture. I made this today as the recipe was written except that I used all of my walnuts on the crust, so I just used cashews in the filling. I absolutely love the filling. However, not a fan of the crust at all. I think I would like it more made with something other than walnuts. I’ve had a bag of walnut that I needed to use up so this recipe was a welcome find, but after having this, I’ve realized the reason the bag wasn’t getting used is because walnuts just aren’t my thing. The crust is kind of overwhelming with walnut taste. We have been scraping the filling off and leaving the crust. I’ll try this again with another nut because it was a good texture and it held together beautifully. Aargh… made this last night for today and it came out AWFUL. I had to bake it extra-long because it was so wet, I shouldn’t have used the 1 c water … also used this crust to make peach tarts and again, it came out very hard and not tasty at all… bummer man, bad ending to a good TG dinner. 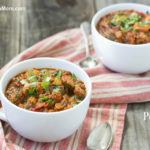 I made this last night and took it to a non-Paleo Turkey Day dinner and it was a hit! My crust was pecans, and also a little dry, so I may fiddle a bit – Paleo boyfriend said he’d made nut crusts with lots of butter before. I may try that. However, the filling was perfect. I subbed macadamias for the walnuts in the filling and I used the whole foods canned pumpkin, and half the water (from reading the comments above that said that it was a little runny for them.) Perfection. The cardamom is a wonderful addition – in fact, I think that’s what won some of my friends over. I even carved the symbol for Pi into the top before I baked it, and it stayed! Hope you had a wonderful Thanksgiving – and thanks to everyone who commented – reading the notes really helped. Any suggestions for a family with a grandson who’s very allergic to cashews? Could I just substitute Macadamias? Paleo Mom- you are my Thanksgiving Hero! 🙂 Thank you for your time and effort spent in formulating these recipes. My son was able to enjoy (as my hubby and I) a very traditional dessert but without all the bad stuff. There were several non-Paleo eaters that tried the pie and were pleasantly suprised as well. Hope your family enjoyed a wonderful Thanksgiving too! My Grandmother and I tackled this recipe last night in preparation for our Thanksgiving feast and the result was nothing short of spectacular. My only regret is actually telling our guests that the pie was “Paleo”. They would not have known any different otherwise. I just love you Paleo Mom!! Thank you sooo much for what you do and for sharing your gift with the world!! I baked it in a glass pyrex container for 40 minutes. Next time I will use a bit less stevia and may try with less water (I used a cup). The custard turned out delicious– fluffy and almost mousse-like. Will be great and nutritionally dense for when I want something sweet! i made this last night for a post-thanksgiving pot luck dinner, and it was DELICIOUS! the only recipe modification that i made was omitting the water. i will definitely make this again — thank you! I made this yesterday, and while it tasted great, it turned a funny color. I did use canned pumpkin, It looked fine at first, but then turned almost the color of the ground cardamom, like I added a bit of cocoa to it. I used fresh walnuts, instead of bagged. Not sure exactly what happened. hi, so mad this pie over the weekend and its very gingery tasting? any recommendations on how much less ginger to use and if i wanted to use cinnamon how much or how to alter the ingredients with cinnamon? If you have a favorite pumpkin pie recipe, just use all of the spices from it instead of this one. I just made it!! So good!! I didn’t use much of the water! Love it love it!!! 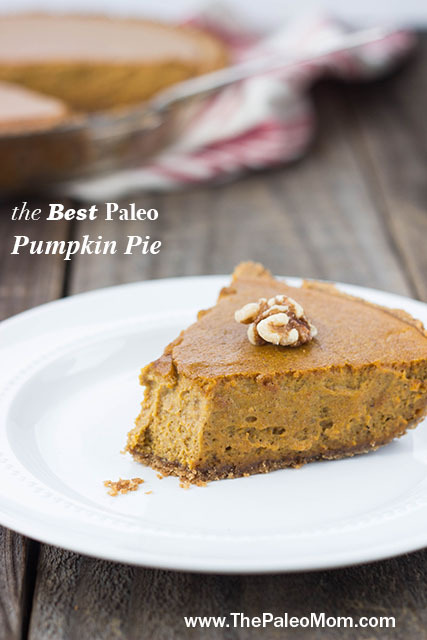 This is the best pumpkin pie I’ve ever had, Paleo or not! Delicious, thank you so much. Best pie ever! We skipped the water though (initially by accident) and it turned out great. I am afraid to add it back in now. Lovely! I had too much custard for my case so I buttered & lined 2 ramekins with shredded coconut & baked them alongside the pie – just having one now with breakfast – they turned out great. Can I come live with you? I LOVE pumpkin pie. I. hate. to. cook. I’m guessing that’s a “no” then! Ok, you’ve talked me into it… I will attempt the custard part sometime after I recover from my hip replacement surgery tomorrow!!!! One thing I’ve sorely missed since first going gluten free (Celaic) then vegan (casseine) was pumpkin pie on Thanksgiving. After cooking all day long that was my favorite part! Not being able to use eggs has just derailed me on that. What do you suggest for those of us that can’t eat eggs. BTW I am about 2 months into the AIP. That looks SO good. Next pumpkin pie I make will be this one, for sure. I am making this for my Mom’s b-day this weekend. Did you grease your pie pan with anything? Thank you so so much for this great pie! Just made this for Canadian Thanksgiving with a pecan crust. Did a little taste test tonight and it seems great. I will probably use a little less cloves and cardamom next time. For my first attempt at any sort of pumpkin pie I am impressed. Thank you Paleo Mom! This is so delicious licking the custard bowl….I am excited to try the finished product. The only problem – my pies have cracked while cooling. Am I doing something wrong? Nope.. That just sometimes happens with homemade pumpkin pie, especially when they cool quickly. Seriously can’t wait to make this for Thanksgiving! Now let’s all hope I can pull it off.. Wanted to say thank you for a fabulous recipe. I made it yesterday for the family and everyone loved it! Tried the recipe yesterday. It doesn’t taste anything like pumpkin pie. So bummed. Was hoping for the real deal. It tastes horrible and I can’t figure out why. Followed the recipe exactly too. especially after it came out of the fridge. For the 2nd pie, I decided to try pecans instead of walnuts in the crust so maybe these won’t stick as much. Oh, and I topped it off with freshly whipped coconut cream. Yummy! Update: the crust made with pecans came out perfect & I only baked it for 12 minutes. My husband loves it just as much as my old pumpkinpie recipe. Thanks so much for this recipe! Hi! I am getting ready to make this and was wondering if you though cinnamon would be a good substitute for cardaman? I was wondering what to use as an egg replacement. Thanks! But I was wondering, just like you’re a “pumpkin pie snob” (your words 🙂 ), my husband is a sweet potato pie snob. Do you have an equally amazing recipe for sweet potato? If not, do you know of one I could use? Thanks so much for all your hard work to help all of us! I’m trying to remember if I’ve seen one (something about marshmallows is ringing a bell, so that probably means I wasn’t looking at a Paleo adaptation). If you have a family favorite recipe for me to look at, I could work on an adaptation. Hi, curious as to how this should be stored… assuming any leftovers remain 😉 Is on the counter ok, or should it be refrigerated? Thanks! This was amazing! I loved it, especially the next day after being refrigerated. I made this pie last year and simply adored it. 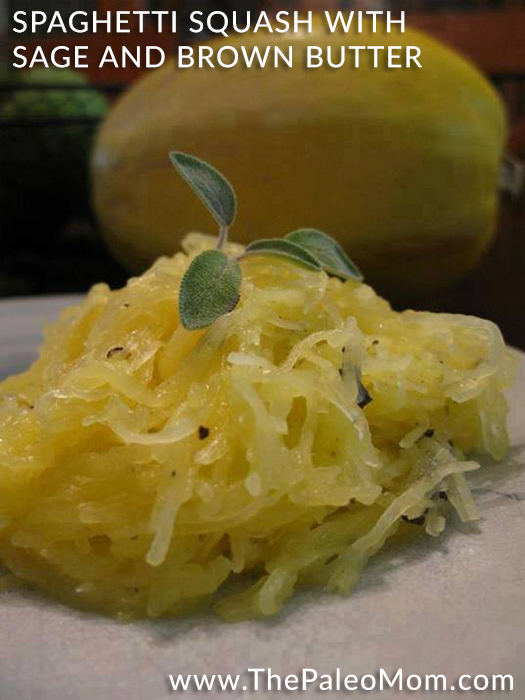 I plan on making 2 this year, one for our own Paleo thanksgiving and one to bring to a SAD thanksgiving. The question is, how many days in advance can I make them? Thanks for all of your hard work on recipes, blogging and the book. I’ve preordered it and can’t wait to hold your “book baby”! I’ve done 2, but I think 1 is better. 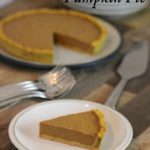 Before I met my husband, I didn’t know that most people ate their pumpkin pie was a solid baked gross concoction…my family’s version was a light, airy version that consisted of canned pumpkin, Dream Whip (remember those envelopes??? ), pumpkin pie spice and a boatload of sugar placed into a graham cracker crust. This recipe actually has the taste and texture of the best of both pies! I’ve never liked a baked pumpkin pie before yours. 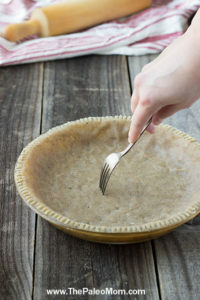 My only changes were to use pecans in the crust, leave out the water (was perfectly smooth and creamy without) and replace the listed spices with a generous tablespoon of Penzys Apple Pie Spice. I made it for my in-laws’ Thanksgiving over the weekend, but it was “forgotten” when it came time for dessert….oh well – we’ve been enjoying it out of the fridge for breakfast! I am in charge of baking the gluten-free/dairy-free pies for my kids’ school’s fundraiser this year. I made a trial pie over the weekend and was thrilled–I don’t even like pumpkin pie, but this recipe is so good! We’ve been eating the “practice pie” for breakfast and I have the fundraiser pies in the oven right now. Thank you for providing such a great alternative to a traditional holiday staple, especially one that does not use coconut milk, since I don’t like the flavor it brings to the other Paleo pumpkin pies I have made in the past. Used cashew butter instead of cashews and now I’m worried as I made ahead of time and both custard and crust is the refrigerator. I did not add water so far as it was creamy should I do anything before I bake? Do you bring down to room temp before baking when you make ahead of time? I’ve never done that before… I’ve baked the whole thing ahead of time, but not let the custard sit in the fridge in the crust before baking, so I don’t know. Also, I far prefer the texture when you add some water (it can be a little too dense otherwise). Just made this. Fricken awesome! I’m SCD so Idoubled the honey instead of maple syrup. Soooo good! Thank you! Thank you for the reply. You are awesome! I will add some water and luckily I did not pour into the crust but rather put them in the refrigerator separately I will let them get to room temp and then pour in Thanks again I’m two years in with being Paleo and could not have done it without you ! I made this last year for thanksgiving, and everyone liked it SO much, thank I’m making it again this year. Even my dad raved about it, he’s a processed food junkie. My mom bought him a store bought pie because he doesn’t like my “weird concoctions”, but he preferred this over the store bought! what a great recipe! getting ready to make it again tonight! woohooo! This was a hit at my home. Mine came out darker in color, but was delicious. Crust tasted like traditional crust. My non-Paleo family was impressed. Thanks. I used pecans for the crust and pecans & walnuts for the custard. I didn’t need any water either and it was fantastic! It came out darker as well and my mother in law actually said it was too sweet, go figure. I loved it, more pie for me! This was our first Paleo Thanksgiving, and we were pretty bummed heading into it, thinking of all of our usual foods we would be missing. This pumpkin pie, however, totally erased any grumpiness we had! We had a mixed gathering of Paleo and non-Paleo folks, and they ALL said this was the best pumpkin pie they had ever had. I concur. Thank you, thank you, for this amazingness. I made this pie for Thanksgiving and it was terrific! Even my 20 year old son preferred this pie to the the locally made berry crumb pie I bought as a back up in case I screwed this one up. One recommendation; make a note in the crust recipe to keep the egg yolk for the custard recipe. As a guy, I of course didn’t read through both before starting. But the recipe is a keeper and I can imagine the crust would be tasty in any number of pies. Thanks for a great recipe! I didn’t use any water but absolutely loved the filling! It was the perfect texture for us. What a find! Thanks for sharing this. Made this yesterday for our family Thanksgiving. I used canned pumpkin, and didn’t add any water, partly because I thought it seemed liquidy enough, and partly because my food processor bowl was already full! The only other thing that was different is that I used cashew meal (from Trader Joes) instead of whole cashews. Turned out great…..not dry at all… only thing is that the kids wouldn’t eat the crust. I wonder if it could be sweetened or spiced to make it more kid friendly? They did, however, love the custard filling. And I let them eat it for breakfast, too. I made this for thanksgiving and it turned out wonderfully delicious! Everyone who tried it (all non Paleo) said they couldn’t believe the filling wasn’t “regular” pumpkin pie filling. I used canned pumpkin and omitted the water. The crust was OK, but a little dry and also could be a little sweeter. I am going to make the pie again for a work pot luck. I am going to try using pecans for the crust as I see some people on here have had success with that. There were a couple of comments where you suggested using macadamias in place of the cashews. I wondering, have you actually tried this or has anyone on here tried it? I am not currently eating nuts (AIP) but even when I did, cashews never settled right with me. I did however eat macadamias with no issues. So for my day of eating a few non AIP items, I wanted to avoid the cashews. I will still probably try even if you have not tried it yourself, I am just curious if you did and what the turnout was. I’ve made the pie several times with macademias as my Dad is allergic to cashews. Personally, I think its even better than the cashews! I did find it challenging to get unsalted macademias though, so i shook loose as much salt from them as i could and then omitted the salt in the recipe. I also used no water as I found the pies more likely to crack when cooling when water was in the recipe. 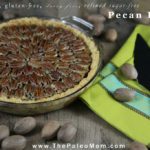 Re a sweeter shell, I personally found the pecans a little too strong, but i did brush some honey onto the walnut shell as soon as it was removed from the oven, which went over well with my family. How do you make your coconut cream? It sounds great! This is so clever. I can’t believe how creative you are – what a gift! 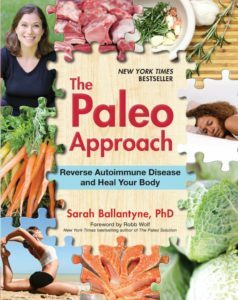 I am recently put on a sugar-, gluten- and dairy-free diet (the nutrittionist actually mentioned “Paleo”) and have been looking for healthy alternatives for satisfying my sweettooth. Pumpkin pie is one of my favorites. I usually shy away from these kinds of things, but you’ve explained the recipe and the photos are very helpful. So, I am going to give this a try. Thank you. 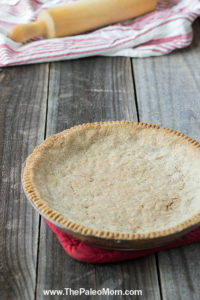 Do you know if any Paleo pie crust recipes that are both nut free and coconut free? I’m allergic to almonds. What would be a good substitution in the crust? It may not be Paleo (and don’t send the haters with the pitch forks after me), but it’s an alternative if you have nut allergies. Hope this helps! Ground pumpkin seeds, sunflower seeds, or sesame seeds all should be able to be used as a direct replacement for the almonds. My Dad’s allergic to cashews, so I always use macademias instead. it works perfectly, though they are slightly more expensive. I was so looking forward to this recipe – it looks so yummy!. Unfortunately, those of us on the AIP protocol can’t eat this dessert – no nuts, no eggs, no allspice, nutmeg or cardamom. Instead, I plan to make a variation of the “Parsnip Vanilla Custard” with pumpkin instead of parsnips (see The Paleo Approach Cookbook” p. 351). Pumpkin custard sounds really good to me! When I was on AIP, I was determined to have pumpkin pie! I made a lard crust with coconut flour and tapioca as the flours and for the custard I used gelatin to replace the eggs. It was great! I wish I could find the recipe! Sounds good can’t wait to try it! I am allergic to nuts (both tree and peanuts). Do you have any non-nut crust recipes? My filling looks to watery, will it thicken while baking? I added less than a cup of water and increased the pumpkin. Any suggestions for how to make this egg-free AND well textured and tasty? Thank you! I have been making room for food allergies and some day I am gonna tell them to make room for me! Enough already. However, until that time, I am enjoying the creative alternatives. Thank you! It would be nice if there’s an answer to this. Made this for a Halloween Party. Pumpkin Custard was fantastic, but I need to work out how to sweeten the pastry up (I have a wicked sweet tooth and miss baked stuff like nobody’s business). Thanks for the recipe! I would like to make this ahead of time and freeze it. do you think that’ll be ok? Do you recommend soaking the cashews (for the filling) before processing? Thank you for the recipe! Those of us who usually feel restricted by the holiday traditional food can now celebrate again. I’m going to try this recipe for Thanksgiving (i’m so excited), but I was wondering, since I dont’ want to buy all the different spices, could I just use the Pumpkin Pie Spices (found at Trader Joe’s) ??? if so, how much do you think I should use ???? I was really looking forward to loving this recipe but alas. The amount of Cardamon and no cinnamon made it taste more like an Indian lassi instead of pumpkin pie dessert. And I’ll stick to coconut milk rather than nuts in the pumpkin custard cuz it was incredibly filling in the stomach with a lot of excessive nut calories, carbs and fat as opposed to if coconut milk was used. The crust also burned very easily and didn’t help the pie out any since the nuts in it were even more filling. I enjoy that you use plantains in a lot of recipes that other bloggers end up using nuts for. But I’ll probably go with a different pumpkin pie recipe. good crust and texture but way too much spice! I didn’t have cardamon so I used cinnamon instead and the flavor was perfect. I agree with you about the nut calories, but I used them and cashew butter in lieu of cashews and it was really rich and delicious, a decadent treat for sure! Yes, i would be interested to know about the pumpkin pie spice. I have a budget and adding too many extra spices is not in it as they are expensive. I do have pumpkin pie spice but just need to know amount to use. Some places sell bulk spices and its much cheaper to buy them that way. Just made this pie, everything about it is awesome!! Thank you! I have made this pie 3 times now and love it every time. I always get rave reviews and most are surprised to learn there are no grains in the pie. Excellent Recipe. To reduce the expense of the spices, I always buy them in bulk and just enough – It usually works out to be less than $1 for all of it. Good Luck! The instructions for adding 1 cup of water to the custard was a little confusing. I re-read it several times and concluded that I should only add water if my blender/food processor has a problem mixing all the nuts. I have a vitamix and decided that I would only add 1/4 cup water and see how the engine could handle it. It was no problem. I didn’t add any more water. The pie looks gorgeous. I can’t wait to bring it to Thanksgiving dinner tomorrow. Thank you! Just made this…used 1 TBD of pumpkin pie spice. .tastes awesome! I made this for Thanksgiving and it was delish!! I had a little problem because it wasn’t done after 45 mins. I brought it to my Dad’s and went to serve it and it was soup! So I popped it back in for another 30 mins, let it cool off a few mins and it was finally done. Not overdone at all! I don’t know if it had anything to do with the fact that I had foil under and around the glass 9 inch pan to protect the crust from burning around the edges, but when I put it back in for the extra 30 mins. I left that off. It was so amazing though once it was finally done! Also, I did not any any water at all. I didnt have cashews so I used cashew butter. Gooood! I had trouble with the crust overcooking and being very very hard. Also very flavorless. Needed some spice/or sweetness and maybe some coconut oil or something to soften it. The custard took 1 hour to cook for me but was really good. Would try it again but would try a different crust recipe…. or maybe grind the walnuts less…not sure. Hi I will also add and continue with my questions that doesn’t sarah go by the AIP in her recipes? Isn’t this her premise on her book etc.?? I guess I am also not understanding why this would be an acceptable recipe with the eggs and all those nuts??? I made this pie for Thanksgiving and am making it again for Christmas. It was soo good. Based on other peoples comments I was scared to add the water and decided not to. The pie turned out amazing and set up nicely. All I can say is “WOW”. Although is non AIP, at least is Paleo and nutritious. I gave some to a friend (marvelous baker btw) and he loved it. I am a pumpkin pie snob. This recipe actually tastes like pumpkin pie. I did add 1 TBSP molasses because I like molasses in my pumpkin pie. Made this at thanksgiving and only added about 2 tablespoons of the water and had to bake extra 15 but turned out perfect. Made again today and added 1 tsp pumpkin pie spice and love it even more. Thank you for all the great recipes. Could the 1 teaspoon of allspice be a typo? That plus the nutmeg, with no cinnamon, was just too much for us. I have made this a dozen times and have adjusted it each time slightly. This time I followed the recipe just as stated here other than the water, which I left out. It is so good, and even better the second and third day. Thank you again! It is still my husbands favorite. After reading all this I am so glad I just eat normal food. I can make mine the old fashioned way. Hi, I made this and it’s pretty good! I used 1/2 CUP of water instead of 1, however I don’t think it needs any water at all. The crust is OK, might need a little sweetness and oils that bubble out of it freak me out! I also did not have enough crust. I am worried about the calories! This whole pie is made of nuts. If I made it again, I might use a pinch of cardamom not 1/2 tsp. and add cinnamon. I did use Pumpkin pie spice instead of All Spice. texture is amazing! Thanks! Love this article. Super stoked to try this tomorrow! Thanks for all the info. The pies are in the oven and I can’t wait to try them! I just wanted to mention… I don’t think you meant to leave Cinnamon out of your recipe, right? I did add it! Thank you! If you actually read her blog post she explains that yes, the spices are adjusted so that cinnamon isn’t necessary. They make pumpkin pie without cinnamon in her family because her brother is allergic. Instead of all those spices, I use 3tsp of pumpkin spice, a couple dashes of ginger, and a sprinkle of cardamom. I also don’t know why this calls for a cup of water. If I added a cup of water to this, it would make 2 watered down pies instead of one perfect one. therefore I only add 1/4 cup of water. I also use 3 eggs + 1white (not yolk) in the custard. Just made this today. Crust tastes really blah – a tiny crumble fell off. Hope the whole piece is better! I have been making this recipe for years and it’s SO amazing! however, Instead of all those spices, I use 3tsp of pumpkin spice, a couple dashes of ginger, and a sprinkle of cardamom. I also don’t know why this calls for a cup of water. If I added a cup of water to this, it would make 2 watered down pies instead of one perfect one. therefore I only add 1/4 cup of water. I also use 3 eggs + 1white (not yolk) in the custard.